What would you do if you were commissioned to write a piece addressing the demographic shifts in L.A. and told to pay especially close attention to places like South Central, Watts and Compton? If you were advocacy lawyer-turned-playwright Evangeline Ordaz and were asked to author a new play for the most prestigious civic theatre in L.A., you would dig. You would draw deeply from the well of unspoken and buried history. You’re assiduous research would take you to places, events and hard, cold truths those well-intended arbiters of culture and high art who award commissions might not have expected, or even cared to be reminded of. Oh well. If you were Ordaz, you would know, instinctively, that whatever considerations lay behind initiatives branded with terms such as “outreach,” “diversity,” “audience development,” “new voices,” “opportunity,” or “enrichment,” writing a play about this city’s traditionally Black neighborhoods which have now become predominantly Latino, in an effort to bring people together, help them understand one another and thus bridge differences would be a daunting prospect for even the most accomplished scribe. Ordaz is well aware that it has never been as simple as sitting down around a hippie, kumbaya campfire—which many of the elites on the boards of civic arts institutions privately poke fun at even as they vote on funding for diversity and audience development programs. They are, of course, now being guided by mandates from elected city, county and state officials who have their hands on the spigots to funding pipelines which have underwritten their favorite civic arts entities with millions of dollars for years. Those mandates call for programming and executive management teams that reflect a commitment to parity and proportional representation based on L.A.’s actual demographics. A veteran writer now working consistently in episodic television for Starz, Netflix and BET, Ordaz was already lauded for her work in association with Company of Angels, Tinseltown’s oldest professional non-profit theater collective. The original Company, founded in 1959, included legendary actors Leonard Nimoy, Richard Chamberlain and Vic Morrow. Ordaz, who co-founded the non-profit East L.A. Community Corporation almost 20 years ago to develop affordable housing and empower Eastside communities, is also the author of Visitors’s Guide to Arivaca and Bordering on Love—among other plays. Her work as a playwright has been nothing short of visionary and prescient. Unsurprisingly, her approach to the play she was commissioned to write by CTG was based on her understanding that social issues unfolding around the politics and geographies of racial or ethnic division were hardly a “black vs. brown” dichotomy. They were more accurately subjects that could be not decontextualized and separated from the ominous shadows and cumulatively traumatic legacies of colonization, slavery, Manifest Destiny and, yes, even gentrification. This Land, the innovative full-length play she delivered, adds Ordaz, was based as much on her research as it was on her profound need to examine the true roots of division and difference filtered through her experiences as both a people’s attorney and an artist. “I started online,” Ordaz explains about her digging. 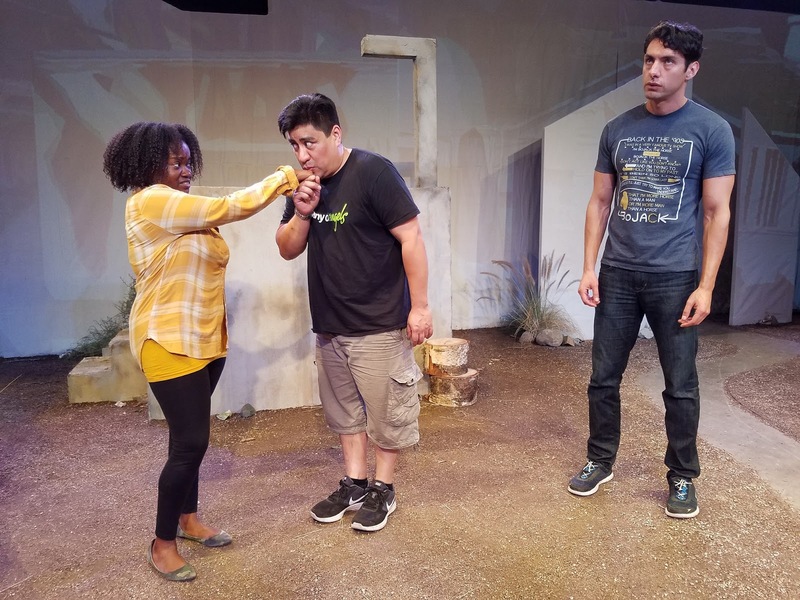 “And just took it from there, using real events and going all the way back to the native Tongva.” The play was developed as part of a workshop series supported by CTG, with considerable input, Ordaz notes appreciatively, from former CTG Literary Manager Pier Carlo Talenti. The workshop culminated with a staged reading of This Land in 2015 at the Watts Labor Community Action Committee (WLCAC) Center, in the heart of the community where the play takes place on land the play’s thoroughly memorable characters call home in scenes that transpire across a 170-year ribbon of time. The reading, which this writer attended, was so well received that although cast members worked with copies of the script for reference, it was nonetheless rewarded with a standing ovation. Even as a limited production, the story pulsed with a translucent beauty, told in overlapping and simultaneous scenes with the past, present and future meeting and blending and curling through and around each other as if strands woven deftly by gentle unseen hands into a shimmering cosmic braid. In a nod to the taco truck which figures prominently in the tale, audience members were treated to complimentary street tacos at a post-reading reception and lingered long after the curtain call. Earlier this month, the play was debuted as a Company of Angels world premiere at a newly inaugurated theater space just east of downtown L.A. in the Boyle Heights neighborhood known to local residents as Big Hazard. Staged in a converted industrial space graciously offered by Legacy LA, a non-profit neighborhood youth empowerment organization, the production runs through November 13th. Directed as an ensemble production by Company of Angels Artistic Director Armando Molina, Ordaz’ husband and creative partner, the play stars Jeff Torres, Ian Alda, Cheryl Umaña, LeShay Tomlinson, Johanna McKay, Niketa Calame and Richard Azurdia, all doublecast. Set in 1843, 1848, 1949, 1965, 1992 and 2020, the production features Scenic and Lighting Design by Justin Huen, Sound Design by Rebecca Kessin and Costume Design by Manee Leija. Ironically, the converted warehouse space in which the play is staged—and the company’s new permanent home—sits squarely on the grounds of what was once the Hazard Park Amory in an impoverished community that now finds itself in the cross-hairs of gentrification. Residents of the historic Ramona Gardens housing projects will be particularly vulnerable to the insurmountable biotech industry juggernaut that L.A.’s civic, business and government leadership have all signed off on. It is only a matter of time, say most observers. This writer was himself, displaced from a live and work creative space only blocks away a year ago. On one level, This Land is a multi-hued love story that stretches back and forth with slingshot regularity from the indigenous village of Tejaawta, the expansive Rancho La Tajauta with which it coexisted to a residential street in Watts at various points in 20th Century and into the new millennium. As an exercise in dramatic spectacle, the play benefits from the combined experience of its players, most of whom have spent at least a decade honing their craft. Richard Azurdia as Tongva chief Tomás resigns himself sadly and stoically to the forced abdication of traditional ways. But Azurdia’s own ancient, old-soul charisma sustains the chieftain’s nobility, dignity and wisdom. The infinite love he has for both his daughter and the land remain undiminished, palpable, present throughout. 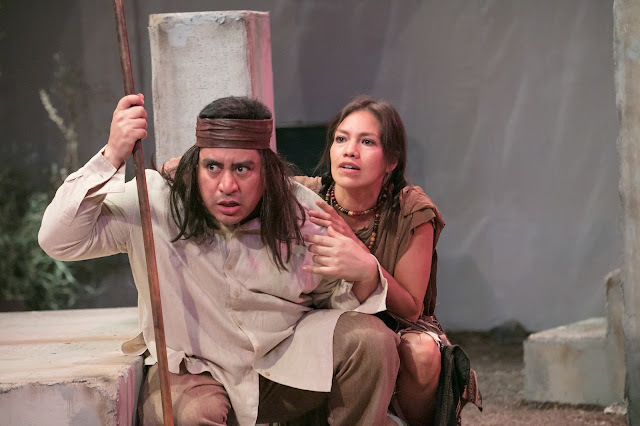 Umaña, as Tomás’ daughter Toya channels all the heartbreaking pain of the original peoples who perished upon the arrival of Europeans without descending into melodrama. Despite witnessing the end of her way of life and being saddled with the knowledge that she is the last of her line, she is no less regal in her bearing or stunning as the embodiment of the Gaia or Pachamama earth goddess. Playing opposite her as Enrique, who understands the mystical beauty and power she represents, Jeff Torres is by turns forlorn and love-struck. However, he studiously avoids becoming the droopy sap, a persona the sad honesty of his naturally down-turned eyes could have lent itself easily to. As Ricardo, he is convincing as the desultory U.S.-born Latino boy weary of bullies but not yet jaded by reality. LeShay Tomlinson Boyce is outstanding as Leola and Sharon, delivering pristine, burnished grace that shimmers. A wan sigh or tightly controlled flash of anger in a look, directed with Exacto blade accuracy then withdrawn, give her away as an actor with high-frequency instincts. A reflection of the director and his casting choices, the dissonance that can hobble productions when an actor of her caliber shares the stage with anyone else never once rears up, even remotely, in This Land. With scenes separated by a hundred years or more often playing out side-by-side on a well-crafted stage flickering with projections that signal temporal changes, and bodies moving across the set with radial consistency, Molina keeps the focus where belongs. During wistful transitions when food is being prepared by characters in one period and the dish is lifted artfully into another, becoming integral to past or the future, the moments become nearly sacred, ceremony touchstones. We see how love and sustenance, like interracial friendship and culinary discovery, are linked. The actors turn and pivot and stride across the two centuries depicted in This Land. In their lateral or diagonal movements toward or away from one another, they also become strands gathered by unseen hands weaving that lustrous braid once again. It is a braiding that brings us all together in the aftermath of hurt and loss and dispossession. Evangeline Ordaz, in her tenderly wrought plea for peace which is also a strident declaration of her faith in humanity, asks us to consider the possibility that it is not enough to open our homes or our kitchens or our checkbooks. Products of migration and immigration, we carry our most secret homes like ancestral prayers in our hearts. It is these we must truly open to one another before all is lost. This is theater Los Angeles, our nation, our world needs. Now. At Legacy LA, 1359 San Pablo St., L.A., CA 90033; Fri. & Sat. at 8pm, Sun. at 7pm & Mon. at 8pm through Nov. 13. Tickets: $25 Adults; $15 Students. Mondays are Pay-what-you-can. Visit www.companyofangels.org for more info.